The dessert café franchise, Creams, has opened in Southampton after the franchisee Mark Hirst, director and shareholder of Walden Gelatos Ltd., secured a six-figure finance package from HSBC. The café in WestQuay Watermark, a dedicated food hall and leisure plaza adjoining the WestQuay Shopping Centre, seats up to 70 customers. Hirst commented: “I am incredibly excited to be opening Southampton’s first Creams franchise with HSBC’s support, as well as creating a large number of jobs for people in the city and the surrounding area. The company offers customers Italian and American style desserts from 40 different flavours of gelato to waffles and crêpes with a selection drinks and shakes. Its bubble pop waffles that it refers to as ‘the latest dessert craze everyone is talking about’ are sundaes in a big bubbly waffle with gelato and come in a variety of flavours from Utterly Nuts to More Oreo. Its sorbets include Alphonso Mango and Amalfi Lemon. 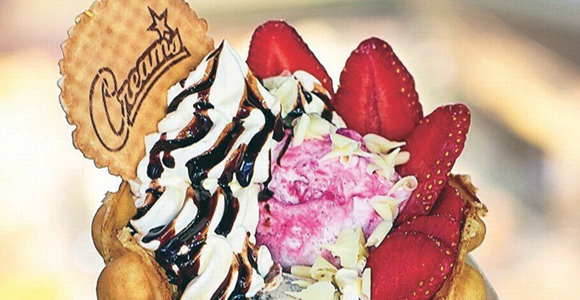 Creams was founded in 2008 and now operates in 70 locations across the UK.